There has been a lot of buzz surrounding the Protostar. As former World Champion John Ando’s signature model, the yo-yo has a lot to live up to. It has been used in competition by big names. 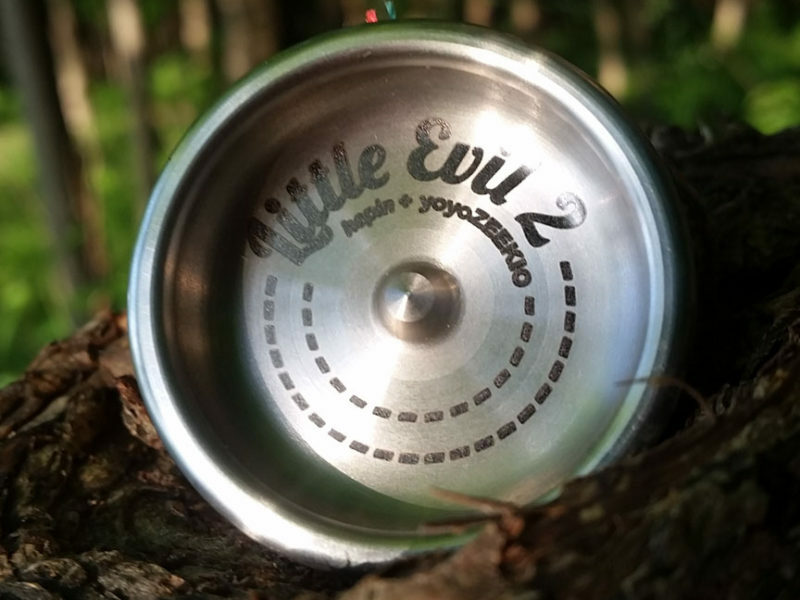 It is one of the best selling high end plastics ever released, and in no small terms, the hype surrounding this yo-yo is huge. The real question I had going into this review was if it was indeed worthy of the hype. Shortly after the last Worlds contest, Bird In Hand had an early model of the Protostar. The prototype I tried… I disliked almost everything about it. I even refused to review it. Then something changed. YoYoFactory went back to the drawing board and refined a bunch of minor things and suddenly the Protostar was the play of choice by many players. This yo-yo was gaining popularity faster than Velcro shoes. I was curious; what changed? I had to find out. I love YoYoFactorys boxes. The Protostar came in a special version of the new YYF presentation box. Inside the John Ando signature box is an instruction sheet that takes a player through the two most important things a new player needs to know; 1: How to put on your string. 2: How to bind. I am impressed by this simple attention to detail. Since this is a plastic, it could be considered a starter yo-yo by uniformed buyers. This little extra that YoYoFactory includes takes that into consideration. The first thing I noticed when removing the Protostar was that the plastic used did not have that “Pulled from a bowl of Jell-o” feel I was dreading. It had been a while since my first encounter with the Protostar prototype, but in this instance the plastic was smooth. I also noticed how large the Protostar was. Speaking of plastic, what a great look. The blue on this model is incredibly bright. The light catches the Protostar very nicely and the translucent body seems to magnify the sunlight. I saw an edge glow green model at Cal States, and it was the same. Brightness. There is no doubt, that the Protostar is a full size yo-yo. At almost 56mm in diameter, the Protostar fills even the largest hands. I don’t have a first generation Protostar to compare it to, but it seems now that the yo-yo fits better in my hand. 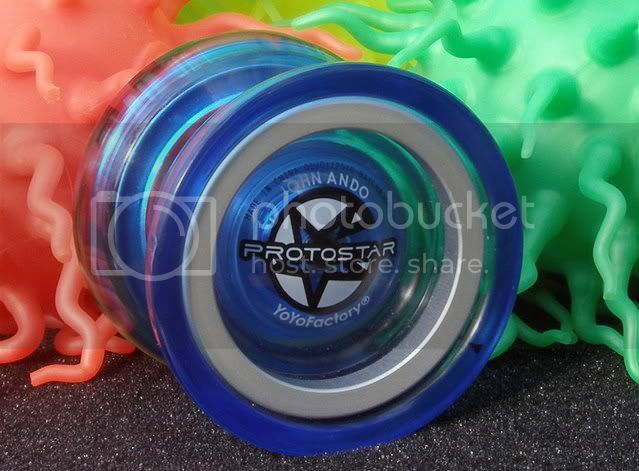 When you break it down to the brass tacks, the Protostar is a plastic body yoyo with weighted inserts. The spacer system has changed since the first one I looked at. It looks like the new spacer setup brings in the gap and also sits tighter in the spacer well. The 4.55mm gap is just the right size for the Center Trak bearing. The Center Trak bearing works very well in this setup. 4.55mm is not a small gap, but it is not huge either. The Center Trak bearing keeps the string off the CBC pad response, but should still provide a stable response when bound. The pad response is replaceable, but I am not sure about siliconing the groove. It looks deep enough, but don’t quote me on it. Regardless, the CBC Pads will last a long time, are not that hard to find, and don’t cost an arm and a leg to replace. Another HUGE feature are these two black arrows. This pair of black arrows are very important. They tell you when your Protostar is screwed together correctly. Because the body of the Protostar is plastic, that means that someone, somewhere, will bear-hug the yoyo together and discover that metal is stronger than plastic and boom, you have a stripped Protostar. 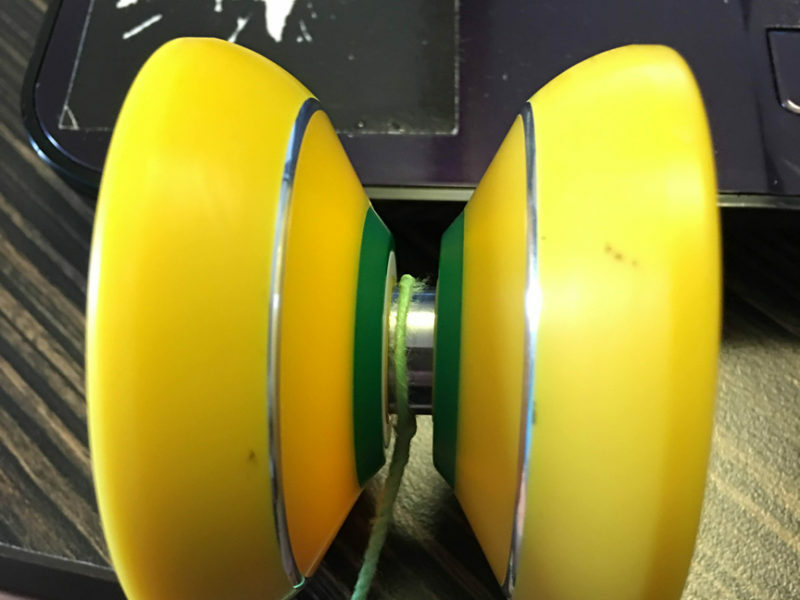 Remember, friends don’t let friends over-tighten yoyos. The Protostar’s catch zone is very clean and open. Transitions were a breeze, and even the messiest of hops were met with a vibration and wobble free spin. The diameter may be a hefty 55.8 mm, but I had no problem maneuvering the Protostar in and out of chops and convoluted string segments. Not much room to IRG, but not impossible either. The key to pulling off an IRG is to get the Protostar on a slight tilt. I was able to get my thumb nail right under the anodized weight ring and pull a 360 without snagging my thumb, and if My sausage mitts can pull that off, I know your can also. Grinds are possible also. Unless your talking about delrin or celeron throws, most plastics don’t grind well so to expect a plastic to grind is pretty silly, but the Protostar is no slouch on a grind either. It is not going to Humming Bird on your finger, but won’t Jackrabbit arround either. I was able to get a fairly consistent grind from the finger up the arm with no major issues. A metal in plastic’s clothing… I hate to use this precise verbiage, but the Protostar is the best plastic I have ever used, and one of the best yo-yo’s I have ever used. Period. It is ridiculous how outstanding this yo-yo performs with no errant movement or flaw. When I threw the prototype of the Protostar at Bird in Hand shortly after Worlds, I hated it. I didn’t feel right in my hand, it had a sticky surface, and it would not respond to anything but the most aggressive binds. With the production version, this is not the case. 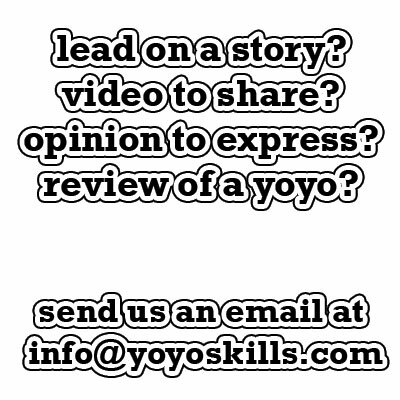 It is easy to understand why so many World Level Champions loved this yo-yo; it’s easy to. The Protostar is priced between $30 – $35 from a number of stores. With such an incredible low price point, there should be no hesitation in buying this yo-yo. I already have one, and I think I need about 10 more just to feel like I am spending enough to justify the performance I am getting. Seriously, this yo-yo is awesome. Edited by Dustin “Splugen” Gunter, who is currently staring at the mirror practicing breaking up with his Lyn Fury. whats the trick where you were spinning the string around the edge? was that a string tension trick? The specs say the gap is 4 .55 mm, but the review says 4.8mm, confusion? So, do only the blue ones have the arrows for alignment on them? My brother has a gray protostar, and I don’t recall seeing them when playing it. I just checked our inventory and all four colors (red, gray, blue, edge glow) have the arrows, but we do have an older red one that’s missing them. I’m guessing that YoYoFactory’s first runs of the red and gray didn’t have the arrows, but everything since has. I don’t recall the red Protostar black arrows. maybe it was an early run. by prototype, do you mean the gray and red ones that were sold last year at Nats, or was there a different one just after worlds at BiH? I played a Red one at BIH right after Worlds. It was a Worlds release, and to my understanding, not the production model we all know and love today. Ah, thanks. I have a gray one I picked up at Nats, and it’s basically one of my favorite throws. I do agree that you really have to try, to bind it. 100% poly string is hard to use, but 50/50 is just fine. were you able to get the arrows to point at each other after unscrewing the halves then putting them back together? so if i buy a red or gray one at yoyonation right now ill get the one that we all know and love now? Absolutely. We’ve also got the blue in stock and should be restocking edgeglow as well very soon. It’s a MAME cabinet he built out of various and sundry parts he had around. Pretty awesome. I never play anything but Galaga on it. I did laugh at loud at Gunter’s little tag. what kind of plastic material used in protostar?? i have a protostar, but it was now wrecked,..
there’s a craked around the axle,..
Nice review… but I’m more interested in your arcade cabinet! Is it an original MvsC unit, or a MAME that you’ve installed yourself? Either way, you’ve basically demonstrated how I like to spend my weekends. Yoyo’ing, standup arcade action… and if you tossed in playing M:TG, it would be summed up in entirety. The tutorials for the shirt is easy enough. Just to go your favorite how-to site or youtube and search for how to silk screen. Would it be too much to ask for a tutorial of C-Cow-B?